﻿Schoenberg, Zemlinsky, Korngold – Bruno Walter knew them all: musicians who sought refuge from the henchmen of the Nazi Party in the New World and found artistic fulfilment there. And they all knew him and his meteoric rise to success at all the great houses in Europe. Formed by working with Gustav Mahler in Hamburg, under whose wing he rose from répétiteur to Chorus Director and then to Kapellmeister, Walter took on further posts as Chief Conductor in Vienna, Munich and Leipzig where the talented artist matured to become a true maestro. 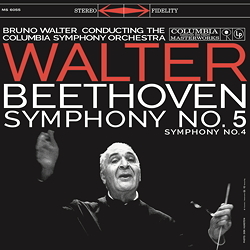 Just when the aged Walter was wanting to retire into private life, Columbia motivated him to record several symphonic works – including Beethoven’s Symphonies – at a time when stereo recording, with its previously undreamt technical possibilities, was just dawning. Even without any knowledge of the still existent recordings of the rehearsals of the Fourth and Fifth Symphonies, the final recording reflects the lifelong experience and meticulousness of the great conductor. In a taut and relaxed manner, and certainly not mellowed with age, Walter brings the scores to glow. The players weave a web that holds the formal symphonic components together with sophistication and richly contrasted, whereby the conductor’s love for tonal detail manifests itself in easily identifiable instruments.